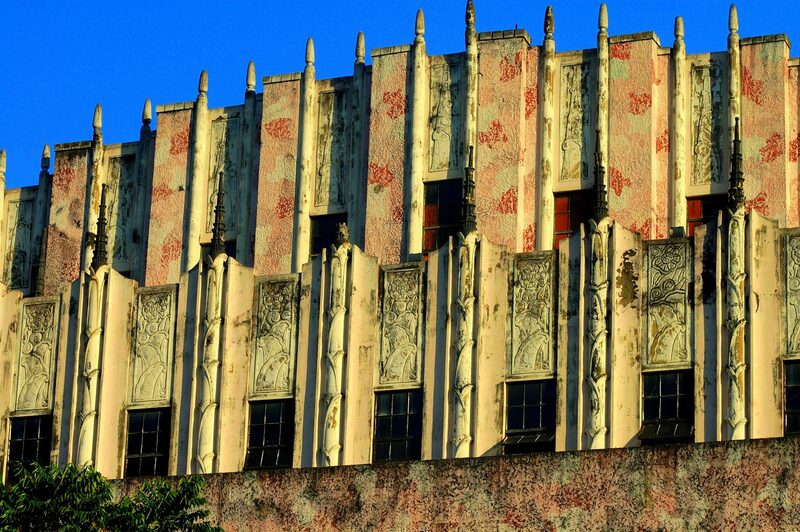 ← The Jai Alai Building, a beautiful example of Art Deco in Asia. Back in the Fifties, we used to live in the Malate district, at first in an apartment on Tennessee street then on Remedios, just a couple of blocks down from the church. It was a little boy’s perfect playground for me. The sari-sari store was right on the corner of Remedios and Dakota. If I remember correctly, I used to haunt an ice cream parlor on the corner of Mabini and Remedios, usually on my trek to Dewey Boulevard and to the sidewalk vendors that were stationed intermittently along the wide paseo to get some kropek or roasted chestnuts. Time was spent with the other barefoot, short-panted boys from the neighborhood playing marbles. I usually lost. As I got older, I would take a jeepney down to my parents’ store on the Escolta, have lunch, maybe see a movie. As an only child, I didn’t have much in the way of parental supervision so I had a lot of time exploring the city on my own. If I caught the jeepney from Mabini, it went northward towards Intramuros, down Padre Burgos past the Legislative building connecting to Taft, seeing the City Hall and in front of us was the massive Post Office. As the jeepney veered towards Jones Bridge, I would catch a glimpse of this interesting pink building on my right. It was rather odd looking, quite art deco. It seemed abandoned. I don’t know, maybe it was, but it was off by itself so I never paid much attention to it. As I got older and more interested in our surrounding landmarks, I read about the Metropolitan which impressed me even more. The Manila Metropolitan Theater building was designed by the Filipino architect Juan Arellano, who stated that he drew the plans for the building with the phrase, “On Wings of Song”, in mind. The theater was inaugurated on December 10, 1931, with a capacity of 1670 (846 orchestra, 116 in loge, and 708 in balcony). 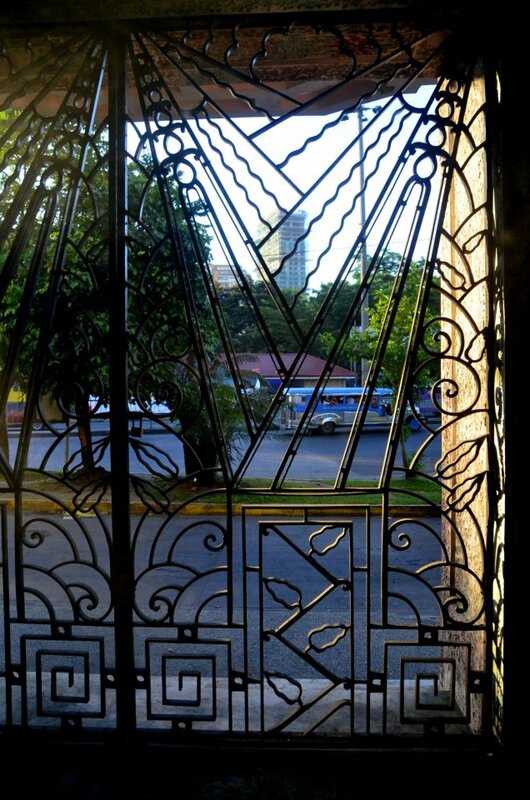 In its heyday, it was the home of operas, the Manila Symphony and a symbol of fine arts and high society of prewar Manila. 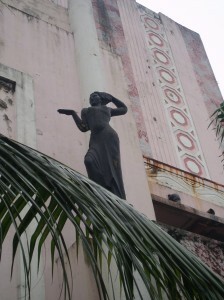 The art deco style by Arellano was enhanced by sculptures in the façade of the theatre by Italian sculptor Francesco Riccardo Monti , who lived in Manila from 1930 until his death in 1958. 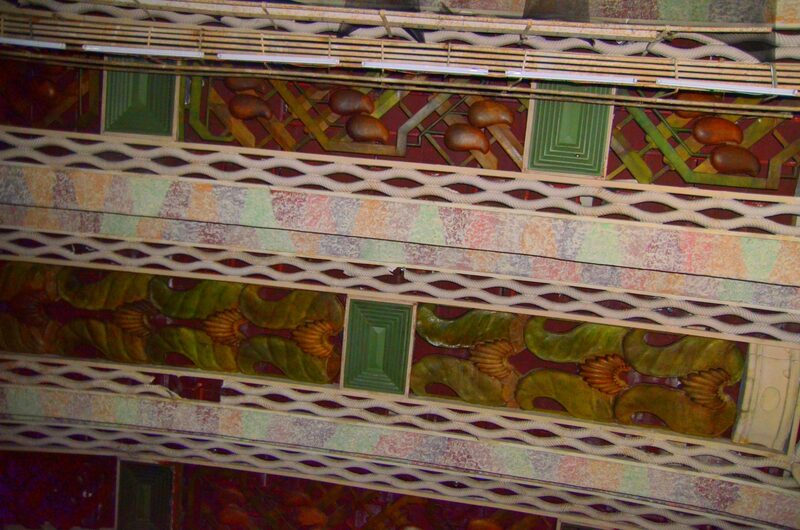 Highly stylized relief carving of Philippine plants executed by the artist Isabelo Tampingco decorated the lobby walls and interior surfaces of the building. The foyer featured marble floors, two wide stairways and a balcony leading to the loge seats. 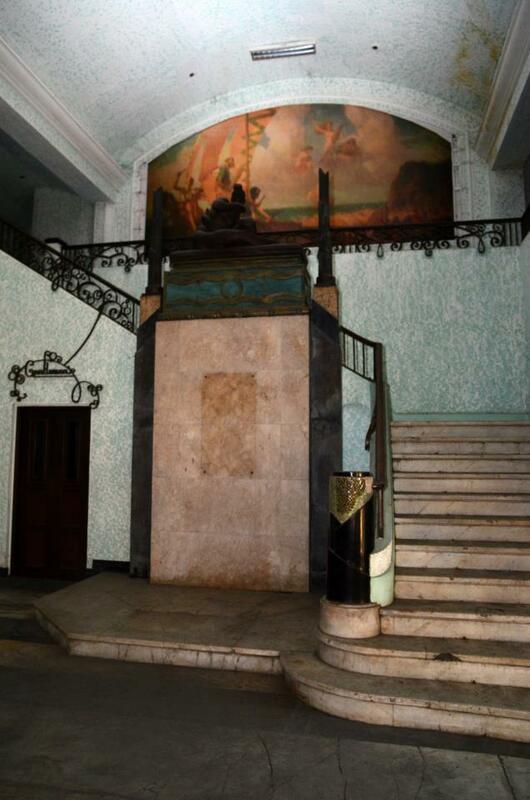 Mural paintings by National Artist, Fernando Amorsolo, named “The Dance” and “History of Music” adorned the lobby. 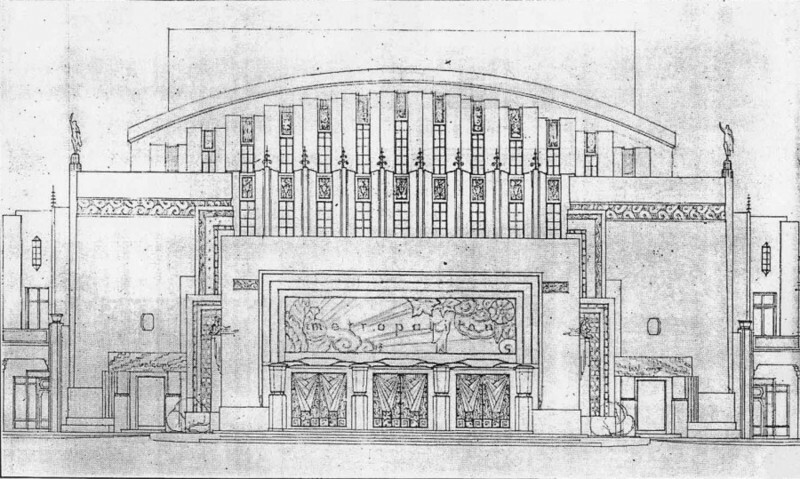 The most striking feature is the great decorative window of translucent glass, brilliantly lighted at night, which corresponds in shape and size to the proscenium opening within the theater. The facade definitely suggests a place of music, with its rounded upper outline broken by many light vertical elements and slender pinnacles or “finals”. 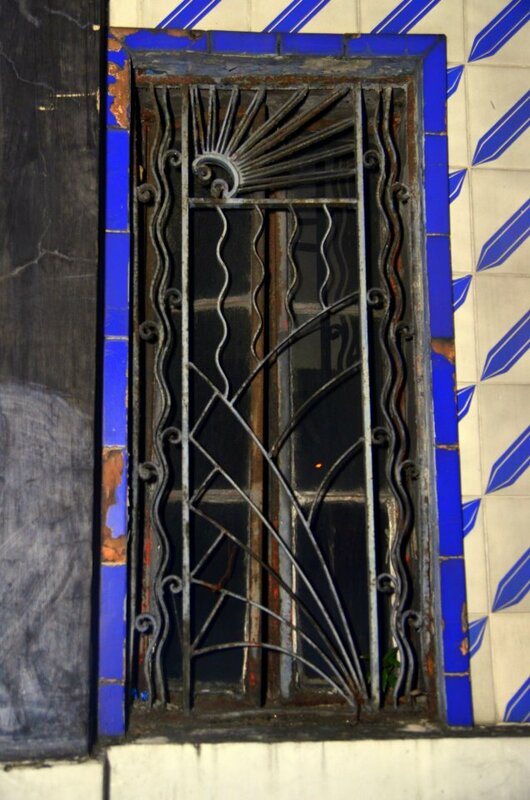 This stained glass facade was commissioned by Kraut Art Glass established by family patriarch Mr. Mattias Kraut . 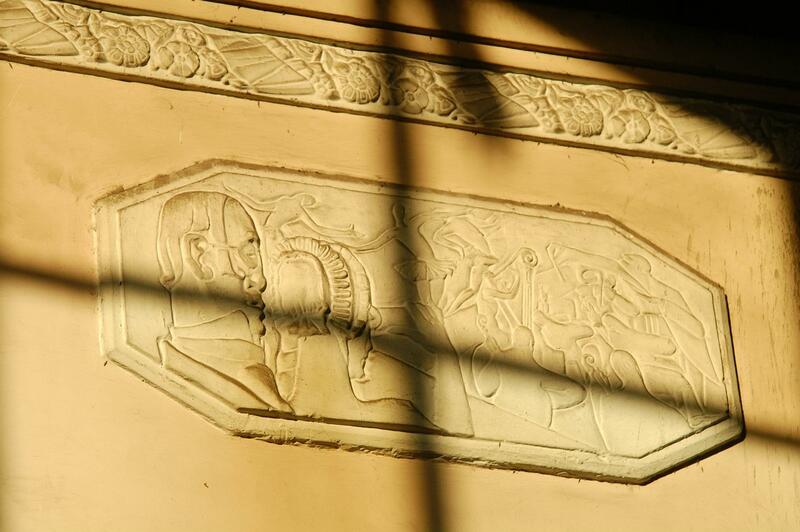 Kraut company is famous for their art glasses since 1912 and the proscenium was done by the House of Pre-Cast. 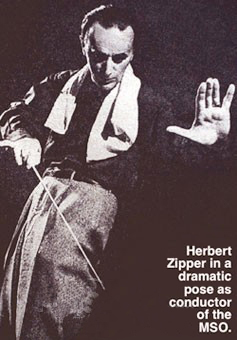 The venue played host to vaudevilles , zarzuelas , performances by world renowned artists like the maestro Jascha Heifetz, and Dr. Herbert Zipper who conducted the Manila Symphony. 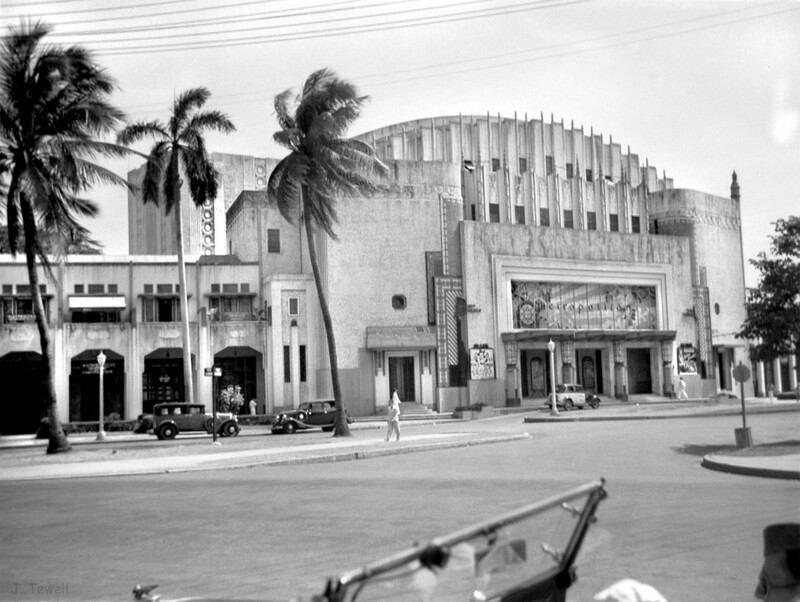 Although also known for his other works: the Legislative Building, the Post Office, and Jones Bridge, the Metropolitan theater was indisputably Juan Arellano’s masterpiece. Its history is quite interesting and unique. There used to be an old theater during the Spanish colonial period, Teatro del Prinsipe Alfonso XII which was built near the present day Metropolitan Theater . 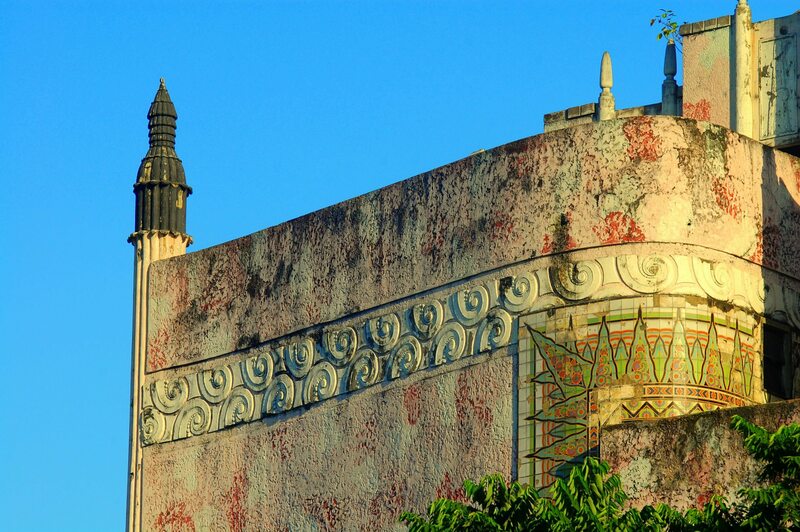 The old theater was the main focal building within the large and sprawling Plaza Arroceros in 1862. 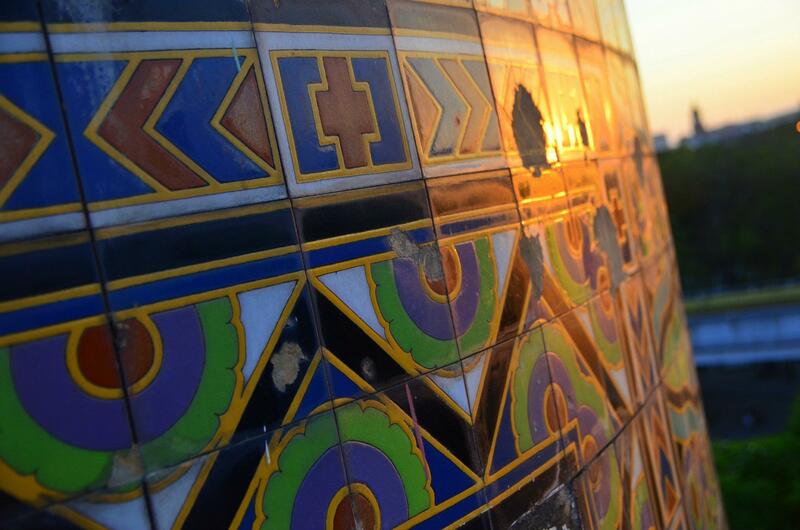 Unfortunately, the Teatro del Principe Alfonso burnt down in 1876, blamed on a irate Muslim terrorist. Yes, they had them even then. 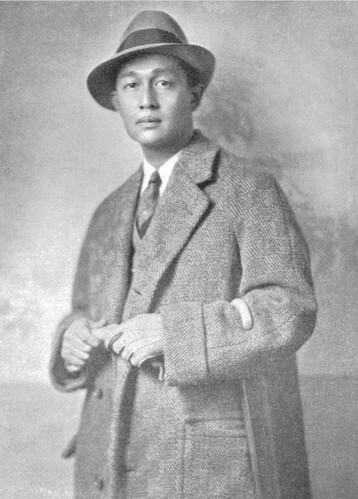 Several years later, During the American colonial period in 1924 , a member of then Philippine legislature proposed that a theater be constructed near the Mehan Garden formerly Jardin Botanico de Manila established in 1858. Finally in 1931, a location was selected on a pleasant site amidst the trees at one end of the Mehan Gardens and just across the wide plaza from the impressive new Post Office Building and the approach to the Santa Cruz Bridge. 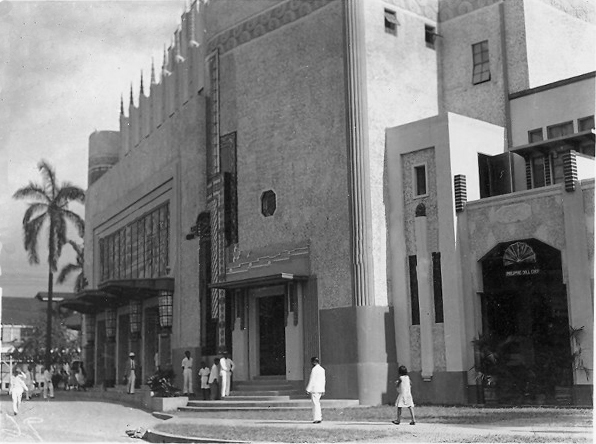 On December 10, 1931, the inspired architecture of brothers Juan Arellano and Arcadio Arellano, following the American architectural planner Mr. Daniel Burnham lured by the unique opportunity of designing in tropical Asia, was completed; a beautiful example of art deco of the Thirties and, some would say, the Golden Age of Manila during the American colonial administration. The courtyards on both sides of the auditorium, with their flagstone paths, grass, flowers, and statuary, are most intimate and pleasing, and lead to the ball room, the restaurant, and the bar. Off the main building, wings were set aside for offices and shops to subsidize additional revenue. The tiara domed with stylized minarets, sensuous female figures in exotic drapes, an exterior with whimsical rope designs, friezes and curly cues, the clashing ethnic -like chimeras and asparagus turrets, the total effect of the architecture is totally different from the other colonial buildings. The building is of an art deco style presenting a symmetry of structure and geometry, full of basic shapes like arc, squares, triangles, rectangles and straight lines. 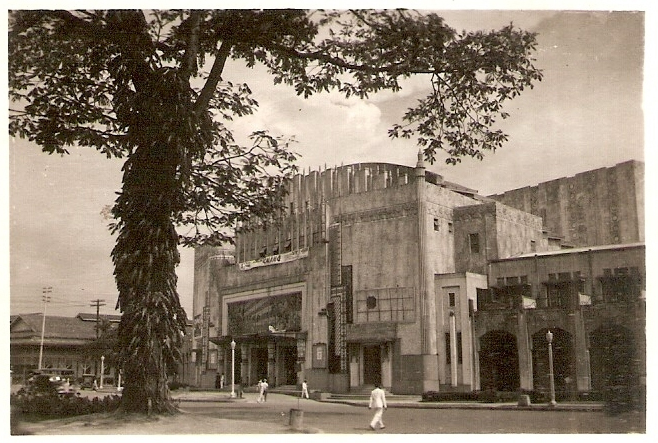 During the Japanese occupation, many theaters in Manila closed down but the Met continued to be the center of cultural entertainment. Badly damaged during World War II, the theater became an ice cream parlor, boxing arena , garage, motel , gay club and eventually a squatter colony of about 50 to 70 families. 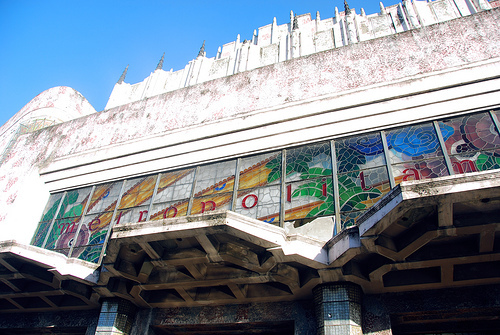 Although the designs and plans of the Metropolitan Theater Manila were burned and destroyed during the World War II , the former First Lady Imelda Marcos had it restored in 1978 to its former beauty however it never regained its former glory. The same perspective showing the badly damaged buildling in 1945. Popular variety television show hosted by Ms. Vilma Santos in the 1980′s to early 1990′s aired on GMA channel 7 provided the entertainment every Friday to the crowd . 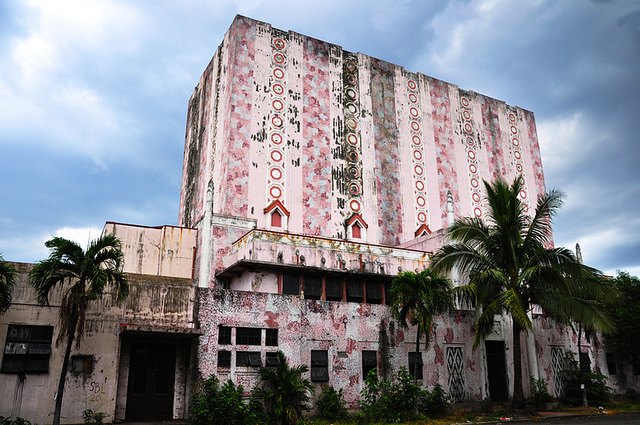 While several top Filipino celebrities made their debut at the grand dame, Its condition deteriorated in the ’90s due to several factors . 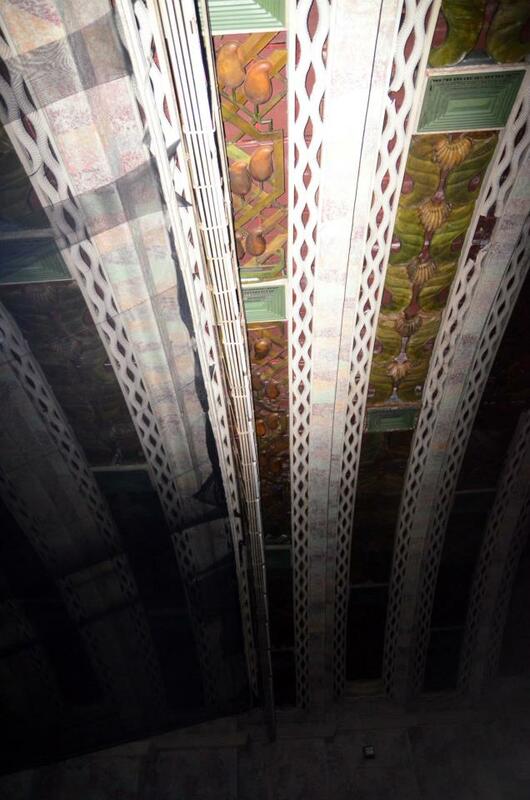 First is the water seepage on Met’s roofing , Second is the strong Bagyong Rosing ( Typhoon Angela) which hit the capital city in November 1995 causing further destruction on the theater’s outer roofing. 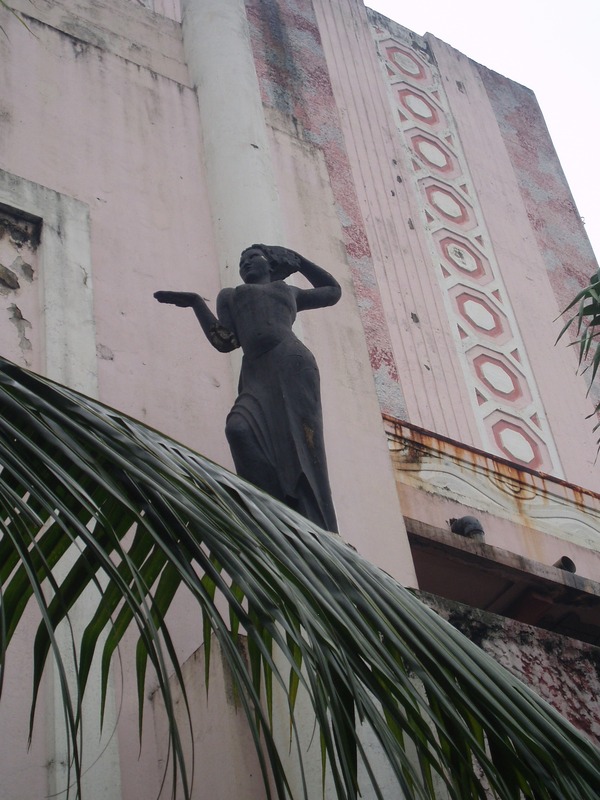 The Met fell further into decay and finally closed down in 1996 following a long-running dispute between the Government Service Insurance System and the City of Manila over its ownership and management. 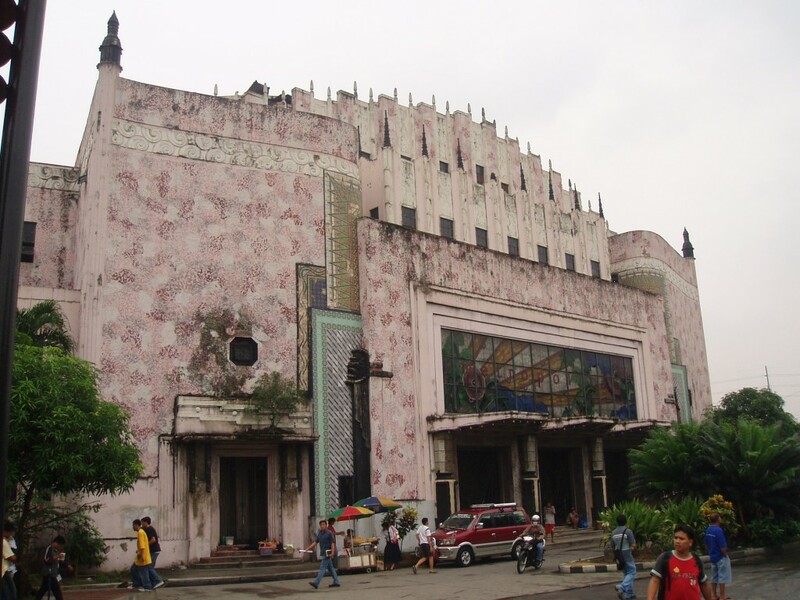 On June 23, 2010, then-president Gloria Macapagal-Arroyo and Manila Mayor Alfredo Lim re-opened the theater after extensive renovations. So, what’s in store for the future of the grand Metropolitan ? Can it be grand once again, adorned with posters of coming attractions of plays, operas, concerts or even be a venue for films ? 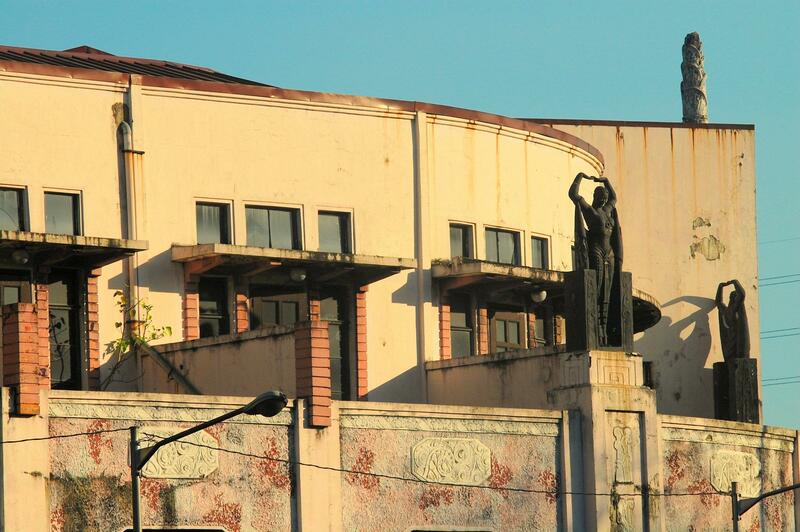 Wouldn’t it be a great venue for a Manila International Film Festival ? Ah, so many possibilities, let’s just not let it die another faded memory. 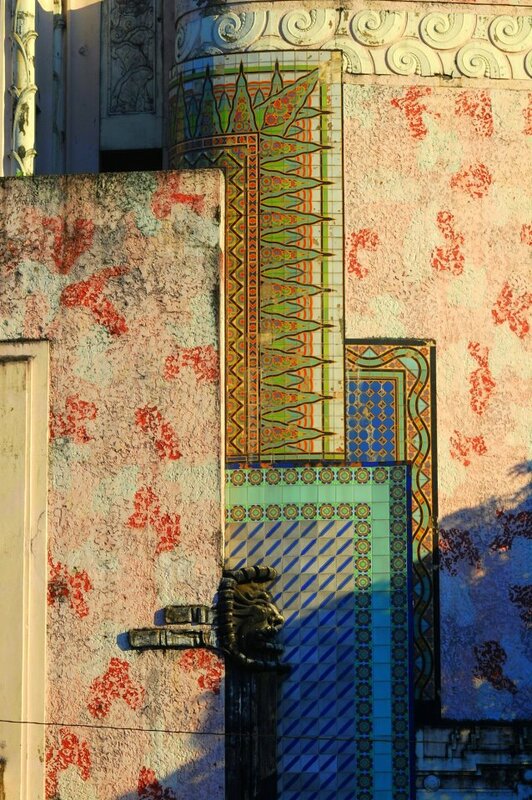 Please view the slideshow below for recent photos of this beautiful example of art deco architecture. 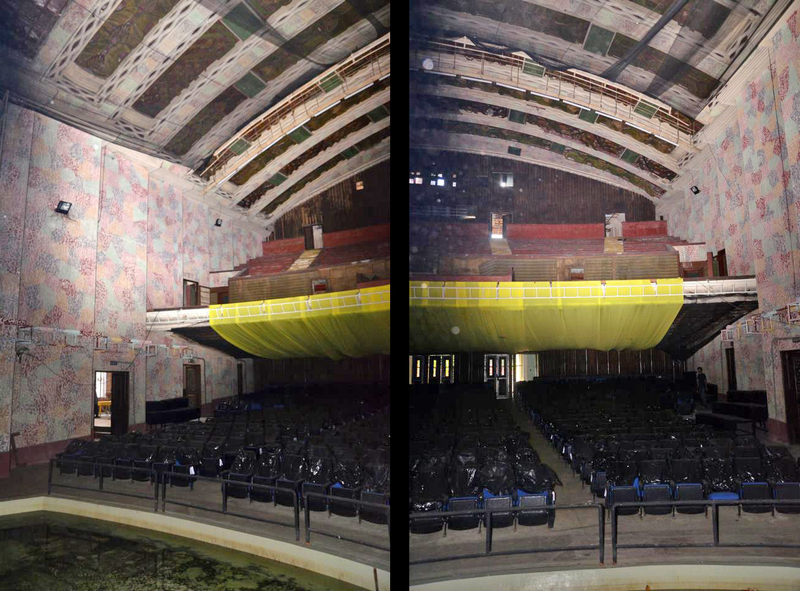 new photos of the Metropolitan Theater , sadly still in a dilapidated state. good day sir, would you please post next for the Post Office Building and The Manila City Hall? among my favorite landmarks.Thank You Very Much. That’s a good idea. I’ll see what I can dig up about those buildings. Thank you ! good day sir,im jimchua im a former employee of Met theater,and also a member of The Mla Metropolitan Theater Chorus,i would like to copy all the pics and the descriptions you made about met theater i just post it to my personal FB account so that i could share it to my ex co workers too…we love the met so much that we cannot forget & move on on our lives….so many happy & sad memories we had…..we like sharing our memories together by posting some pics and the comments come in right away….glad to see some long lost co employees of the MET comments in the particular pics…..of course i will mention your name -the author po. thanks & god bless! Hi Jim, so nice of you to write. I would love to read of some of your stories. If you could share them with me, I can post them on the site. Thanks ! Ang napansin ko maganda ang Pilipinas, ang Maynila noong panahon ng Americans, there was planning. Ang mga achitects ay US-trained, nag-aral sa US. Dapat nga palang magbayad ang mga Hapon, masyado ang ginawa nilang pagwasak sa bayang ito. 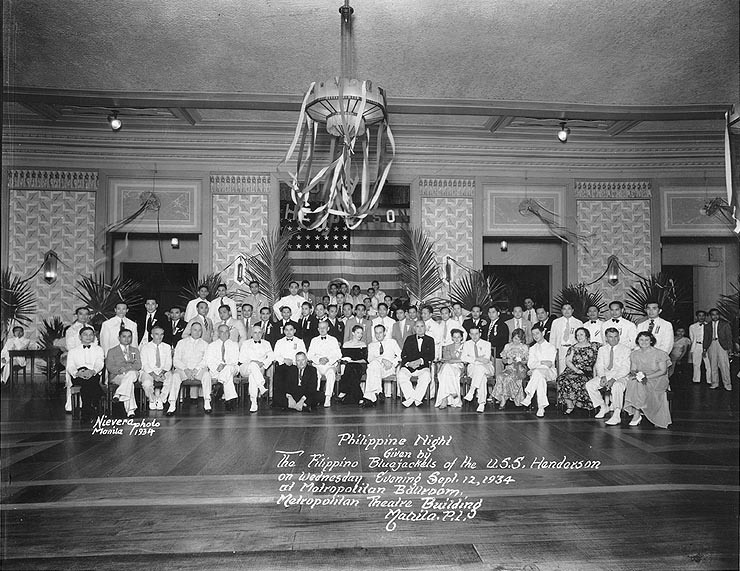 After WW II the glory of Manila was almost all gone. Nakakaiyak. Sana wala ng corruption ay magkaroon naman ng conscience ang mga pinuno na maibalik ang ganda ng bayan, ang naglahong ganda ng Maynila para magkaroon naman tayo ng dignity and pride in this part of the world. God bless Manila. I agree with you say regarding the American period, there seemed to be more planning and not just building wherever without thought to aesthetics. Although I must say that Makati, and south to Tagaytay , parts of Quiapo and others seem to have some design to it. I only hope we can save as much of our history as we can. Thank you for writing ! Thanks, too, Lou. Our country needs people like you. People who can help preserve our history as a nation, our culture of long ago and everything about us, about our land. May God bless the Philippines and the USA. Today we celebrate the 4th of July , the day we became free and so with the Americans. ” Friendly America, let her forever be.” May heaven watch the Philippines and the USA. The american destroyed Manila in 1945,they used 300mm dia.Howitzer conyon,it is the most powerful weapon during that time.They used this canyon in order to minimized the casualty of american soldier. Do you think the Japanese bear some responsibility in the destruction of Manila ? They bombed the Jones Bridge and other buildings as well as torched many homes and killed residents as they ran for cover. I found some pictures of the Gaiety Theater on the Internet and thought you could be interested. I don’t know how old these pics are but the cars are quite modern, so it could be only a few years ago. The building is condemned and by now it’s probably torn down because the real estate is valuable. You’ll remember it’s only one block from Roxas Blvd. so any tall building erected there would have good views of Manila Bay. I recall the Gaiety very well. 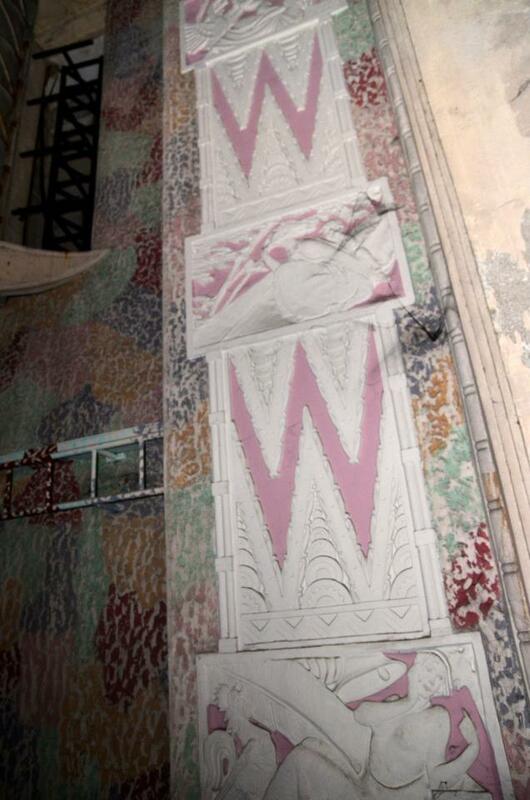 It was designed by Juan Nakpil and constructed in 1935. It was formerly owned by an American but it was not plush, just very basic. The downstairs seats were wooden with woven rattan bottoms, some of which had lice. It was tough for me since I was wearing short pants so I had to sit on the wooden arm rest which was a pain in the aXX. But it was better than lice which were a worse pain in the aXX. The Gaiety showed second and third run movies, the owner must have liked Westerns because there were a lot of cowboy movies. I was scared of the Indians who scalped the pioneers but at the last moment it was very thrilling to see the US Cavalry come charging in with banners waving and bugles blaring. Every Thursday was the serial movie, either Buck Rogers or Flash Gordon. The tickets were 15 centavos. I hated Ming the Merciless, the evil enemy of Flash Gordon. Ming ruled the planet Mongo from his palace and was always scheming to kidnap Dale Arden, girlfriend of Flash. Happily Flash rescues her and returns her to New York, but the serial ends with the hollow laughter of Ming somewhere in the universe….. C-H-A-P-T-E-R !!! Lou, your research is admirable. The last performance I attended in the Met was a whole day showing of all the chapters of FU MAN CHU, some 15 of them, just before the Japanese bombed Pearl Harbor. We brought ‘baons’. Re the Gaiety, I seem to remember that Mike Joseph’s family ran it; our ‘days off’ then in La Salle were Thursdays, and Mike would sneak us in the movie house, then, we would go to Herran, and sneak into a movie house ran by the Eduque family, and finally to Dart St., and let in by Paquing Sevilly, into Cine Paco to watch a Filipino movie. Ernie – great memories to share ! Sounds like you got a lot of free entertainment from your connections. i would love to read more about your recollections of what life was like during the Japanese occupation. For those reading this, “baons” are tin containers that stack onto each other and carried like a lunchbox, each tin containing a separate dish. 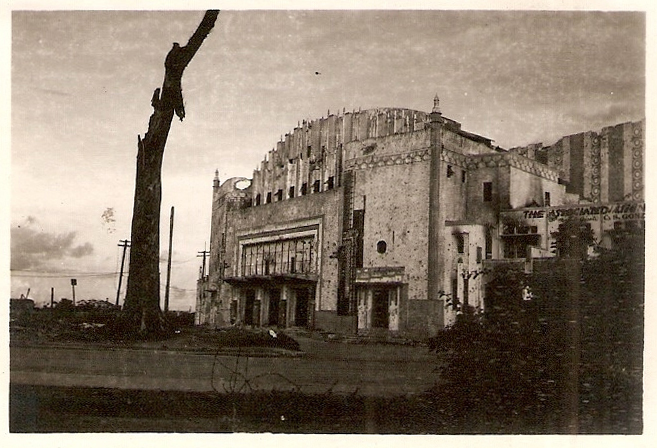 Yes, the Met was the venue of stage shows during the war, as was the movie house just at the Northern foot of the Sta. Cruz bridge (I have forgotten its name). The then upcoming National Artist Nic Joaquin used to invite me to view some of these performances. Thank you for very kind comments, Miguel. Please see my post on the Jones Bridge for photos of the statues of Madre Filipina at the two ends of the bridge and the dolphins at the center. Thank you for writing Jozsef ! I’m glad that the pictures helped you and hope that students like you appreciate Manila’s wonderful heritage and, as you say, perhaps save our landmarks through the World Heritage site. Maraming salamat ! Just recently discovered this blog of yours, and now am reading through all the posts. I was born in 1963 and grew up on Remedios. The ice cream parlor you referred to (Remedios corner Mabini), I believe it was called Milky Way? But I remember watching Disney’s “Blackbeard’s Ghost” (Dean Jones, Peter Ustinov as Blackbeard, and the divine Suzanne Pleshette!!!) at Avenue, and I laughed so hard and loved it so much, that I asked my father if we could watch it again. So he took me to see it a second time, only to save some money, he took me to Gaiety! 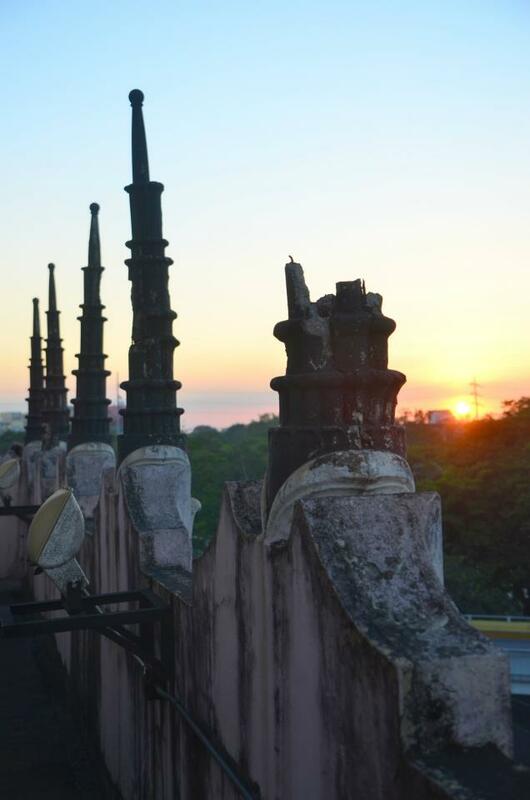 Thanks for all the research and love for this city of ours, our beloved Manila. Thanks for remembering the name of that ice cream parlor. It was driving me nuts ! I’m glad you found the articles interesting. We rented at San Marcelino/Harrison Blvd. This was from around 1962 – 1968.
sad to know that we Filipinos didn’t know how to value our past. this building is a memory of our glorious past. how i wished na sana may may mga organazation na may magmalasakit para sa conservation ng MET. i hope the showbiz industry na magkaroon sila ng initiative para sa restoration ng MET. pahalagaan natin ang mga old buildings natin dahil dito tayo galing. paano tayo makakapunta sa paroroonan natin kung tayo mismo hindi natin alam kung saan tayo nagmula. sa europe kahit more than 500 years na ang mga bulidings, castles , churches nakatayo parin hanggang ngaun dahil inalagaan nila ito para maipamana sa mga tao sa mundo. I watched one of the last few shows at Met in 1995, the play “Kasalan sa likod ng Simbahan”. Pity it was neglected after it closed. I watched it slowly turn into a homeless shelter that stank of waste, a place to be avoided. Manila can use this again – definitely. Why not a hall of justice to house Manila’s courts? Or Manila’s local museum? 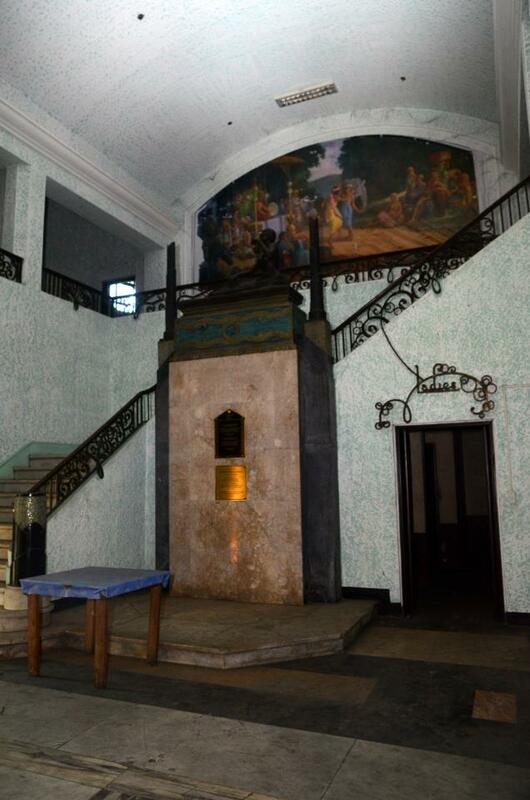 Manila’s local museum is housed in a tiny room at the City Hall. Visitors at European cities marvel at their heritage buildings. 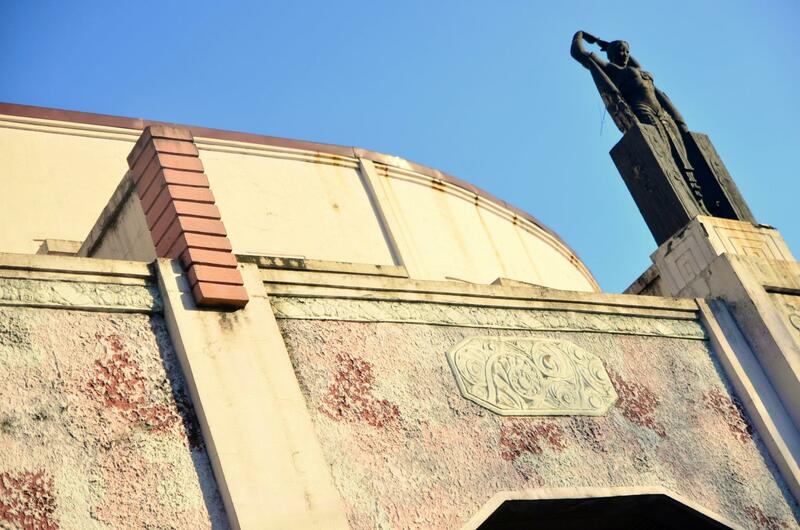 Manila has great potential to reboot its decrepit structures, but with the revelation that Manila is close to being bankrupt I see no end to our neglect of the Met. 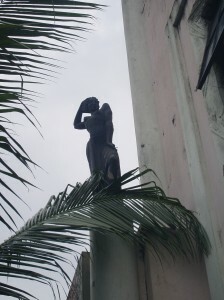 Monti, the guy who made some of the scuptures of the Met, was recently mentioned in the newspapers when his work “The Furies” (on the wall of the Meralco building in San Marcelino) was about to be destroyed. I wonder what happened to it. OMG, I’m so glad to know that the Metropolitan Theater lives in your site! My aunt, Conchita Sunico, spent her last years, as well as her finances preserving the Met and making sure the musicians got paid. I appreciate what you’re doing, too. Whenever I feel subjected to the cold, dreary winters in Seattle, I think of Manila and the days you write about — I get a wave of nostalgia. I was there when you were. Thanks!!!! Hi Mr. Lou! I am a 57-year old employee of a government agency and am grateful for the photos and stories shared through your efforts. 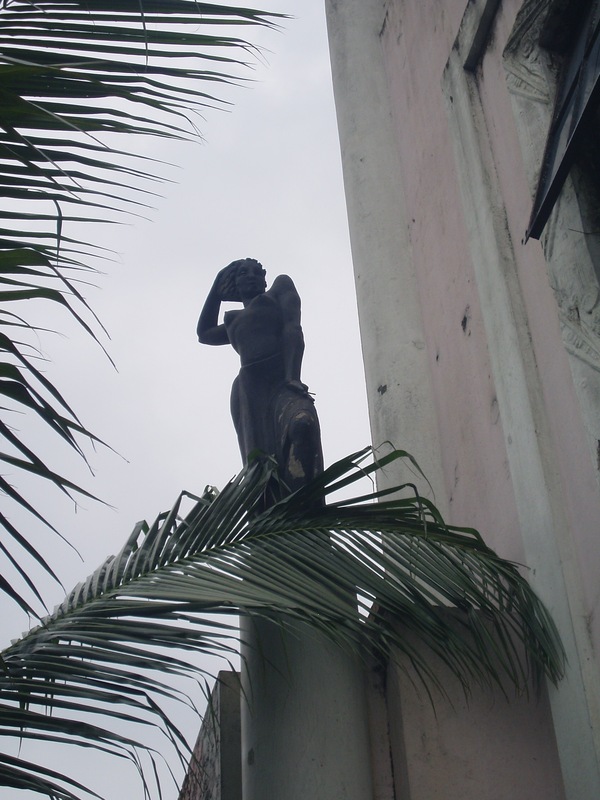 My encounters in “Manila Nostalgia” as well as other sites allowed me to trace or find clues about dredging, land fills, quarrying and reclamation during the 19th century in Manila. Some photos I copied for a Powerpoint presentation and shared them with colleagues at work. Moreover, I was a child of the 60’s and a teenager in the 70’s that often visited Manila for I hail from Pampanga. Your stories and pictures brought me back to memories that I once forgot before all these historical memorabilia. I remember how the bay looked like from Sunset Village at Pasay, the Seafront where I was brought by an American uncle, the scenic drive at Dewey Blvd. and the different establishments and institutions you identified in your stories. Kudos and many thanks to you, Mr. Ng and everyone who collaborated for this website. It really feels good to remember! Hi! Came across your page while looking for details on Manila Metroplitan Theatre. We’re interested to have an engagement/prenup shoot at the MET. Just trying my luck, maybe you would know as to whom should we ask for permits and the like or if they do allow shoots? Hi, I have no idea but perhaps someone reading this may know and respond. GSIS owns the Metropolitan Theater.